Computer generated images have a certain aesthetics to them that make them immediately recognizable as such by the trained eye. Weird Faces Study is an attempt to combine my old interest in illustration with programing, to create something procedural that has a truly individual artistic touch to it and is not instantly recognizable as a generative art piece. 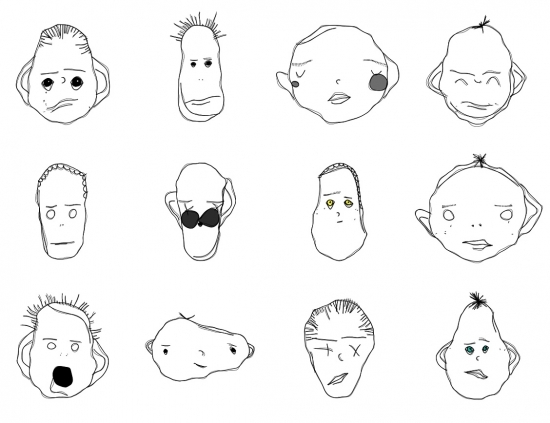 Even though, the faces look hand-drawn, they are entirely expressed by algorithmic rules. Each face is random, each face is unique. Still, they look similar to my actual hand drawn faces. Interesting and cool, especially for things like user profiles with missing avatars.